Authentic original Choctaw and Chickasaw Nations Indian Territory Homestead Patent assigning 130 acres to a member of the Choctaw Indian Tribe. This historic document is transcribed below and is signed by the Principal Chief of the Choctaw Nation, Green McCurtain and Governor of the Chickasaw Nation, Douglas H. Johnston. 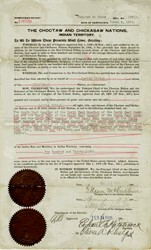 It is also signed by the U.S. Secretary of the Interior, Ethan A. Hitchcock, filed for record: February 14, 1906. The Chickasaw Nation is a federally recognized Native American nation, located in Oklahoma. They are one of the members of the Five Civilized Tribes. The Chickasaw Nation was created after the Chickasaw people were forcibly removed by the U.S. federal government to Indian Territory in the 1830s. Their removal was part of a larger effort by the federal government to relocate peoples from the Cherokee, Muscogee (Creek), Seminole, Chickasaw, and Choctaw nations. The removals became known as the �Trail of Tears�. The Curtis Act of 1898 and the flood of non-Indian settlers forced the Chickasaw and other Indian nations to consider allotment and to agree to terminate independent governments. In 1895 the Dawes Commission began holding hearings in the Indian Territory to negotiate allotment agreements with the Five Civilized Tribes. Although a joint Chickasaw and Choctaw commission agreed to land allotment to tribe members and to reserve coal and asphalt lands, Chickasaw voters rejected the Atoka Agreement of 1897. Subsequently, Congress adopted the Curtis Act, which embodied the Atoka Agreement, ended tribal sovereignty, abolished tribal courts and enforcement of tribal laws, and scheduled all tribal governments to terminate on March 4, 1906. Green McCurtain represented his tribe as a delegate at the Sequoyah Constitutional Convention, an effort by American Indian nations to create an Indian-controlled state in what is now Oklahoma. Johnston was reelected to office in 1904. This was the last election under the traditional Chickasaw Nation government. When the Chickasaw Nation was dissolved in 1906 as a prelude to Oklahoma being admitted as a state, President Theodore Roosevelt appointed him as governor of his people. He served in that position until his death in 1939. In 1907, the legislature of the newly created state of Oklahoma tried to nullify a provision of the Atoka Agreement that prohibited taxing for 21 years the lands allotted to Native American heads of household. Johnston led the court fight against the state. The US Supreme Court upheld the provision in 1912. In 1924, the Johnston administration won permission to sue the Federal government in the United States Court of Claims and recover money that it had obtained illegally from tribal resources. Ethan Allen Hitchcock (September 19, 1835 � April 9, 1909) served under Presidents William McKinley and Theodore Roosevelt as U.S. Secretary of the Interior. He was in mercantile business at Saint Louis, Missouri, 1855�60, then went to China to enter a commission house, of which firm he became a partner in 1866. He was married to Margaret Dwight Collier on March 20, 1869. Ethan and Margaret Hitchcock had three daughters, Sarah, Anne and the Margaret Hitchcock. In 1872 he retired from business, in 1874 returned to the United States, and in 1874-97 was president of several manufacturing, mining and railway companies. He was a member of the Missouri Society of the Sons of the Revolution. WHEREAS, The said Commission to the Five Civilized Tribes has certified that the land hereinafter described has been selected by or on behalf of Lottie Sittel a citizen of the CHOCTAW Nation, as an allotment, exclusive of land equal in value to one hundred and sixty acres of the average allotable lands of the Choctaw and Chickasaw Nations selected as a homestead as aforesaid. The South West Quarter of the North East Quarter ...(Choctaw Nation) of the Indian Base and Meridian, in Indian Territory, containing One Hundred and Thirty (130) acres, more or less, as the case may be, according to the United State survey thereof, subject, however, to the provisions of the Act of Congress, approved July 1, 1902, (32.Stat.641), pertaining a allotted homesteads. IN WITNESS WHEREOF, We, the Principal Chief of the Choctaw Nation and the Governor of the Chickasaw Nation, have hereinto set our hands and caused the great seal of our respective Nations to be affixed of the dates hereinafter shown. Date: December 13, 1905 (Seal) Signed by Green McCurtain, Principal Chief of the Choctaw Nation. Date: December 27, 1905 (Seal) Signed by Douglas H. Johnston, Governor of the Chickasaw Nation. DEPARTMENT OF THE INTERIOR Approved: February 14, 1906. Signed by Ethan A. Hitchcock, Secretary. By Oliver A. Phelps, Clerk. Filed for record: February 14, 1906. DEPARTMENT OF THE INTERIOR. OFFICE OF THE SUPERINTENDENT FOR THE FIVE CIVILIZED TRIBES, MUSKOGEE, OKLAHOMA. This is to certify that I am the officer having custody of the records of deeds of the Choctaw, Chickasaw, Cherokee, Creek and Seminole nations, and that the above and foregoing is a true and correct copy of the deed issued to ELLEN NELSON, as the same appears of record in Book No. 21, Page 564 of the Choctaw Homestead Deed Record. A. G. McMillan, Acting Superintendent By: E. C. Funk, Clerk. In Charge Choctaw Records Date: Oct. 29, 1929. Filed for record this 9th day of April 1931, at 9:00 A. M. By Irene Smith, Deputy. Jas B. Cobb, County Clerk.